Rincomatic ® | 24 years developing practical solutions for cabinetry. Synchronized decorative corner hinges and post for corner doors; innovative, practical, quick assembly and customizable. The range of profile handles of rincomatic, is assembled by clip system: no machining. Optimal assembly of gola profiles by using the exclusive Rincomatic Clip-System. Sugo Handle an ideal complement for a Flat Gola Profile. Relux an aluminium linear profile which holds LED strips allows the lighting in the front and inside the drawer or door when we open. In Rincomatic, we design, manufacture and commercialize quality components for cabinetry. Our trademark is primarily distinguished for the invention and development of practical furniture components, specially focused on kitchen cabinetry, being always in line with the most current styles and providing continuously original ideas that facilitate the assembly work. In Rincomatic, we are always near you and therefore we want to offer you the best service. ¿Do you need any information? Do not hesitate to leave us any question you may have on the following form and our customer service will contact you shortly. 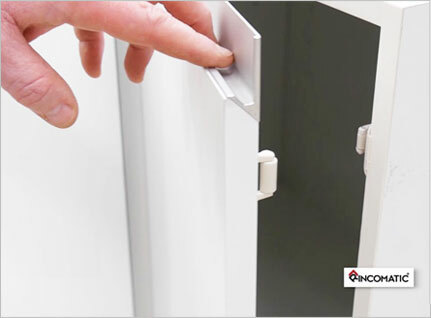 Difference between Gola Profiles and Profile Handles for the opening of doors. Contemporary kitchen design, more renovated than ever.